Happy Monday everyone! Sorry there’s no new outfit post today, last week I literally only wore sweats (that’s the only thing I feel comfy/fit into right about now). So instead I’m sharing a few past outfits wearing one of my favorite bags! I bought this Saint Laurent bag last April and have gotten so much use out of it over the last year (actually a lot more use than expected)! I was a little hesitant to purchase it at first because it’s so bright but I can’t believe how easily it pairs with so many different colors and how often I find myself wearing it! The silhouette of this bag is still available but unfortunately, you can no longer purchase it in this same color. I was on ShopBop a few nights ago and spotted an almost identical bag and I wanted to share with all of you in case you’ve been trying to hunt down a neon bag. I hope you all had a great weekend and thanks so much for stopping by! Gorgeous bag, the color is amazing! The photo with white blossoms is spectacular! Beautiful sandals and the pink jacket is perfect! Wow, that Saint Laurent bag looks great with so many outfits. It really makes your outfits pop! I love when you pair it with matching yellow heels. 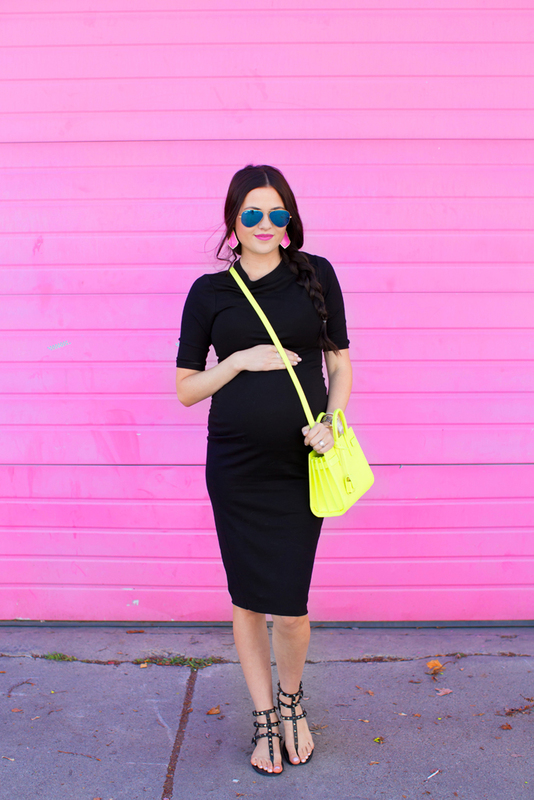 Thanks for sharing Rachel :) I am loving neon bags this season! I bought a bright bag myself a couple months back that I wasn’t sure how much I would use, but I’ve gotten so much use out of it. I feel like a bright bag can really tie a look together! Such a gorgeous bag! Love how you styled it! The bag is amazing and also versaitile, I love the color! great post! love when unexpected items become so versatile! I love this color, i’ve had my eye on the Rebecca Minkoff for weeks! Cant wait to get my hands on it! Such a cute bag! I don’t think anyone is going to judge you for wearing sweats at this point in your pregnancy! haha Enjoy the end of your pregnancy! I’ve noticed your love of this bag as of late. Love the pop of color! You style it well. I love your bag! Such a great color for spring! Love this bag! The perfect pop of neon for every outfit! I love this mini Rebecca mink off bag, you wear it so often I think j might get my own! That bag is such a fun color, it’s awesome you were able to get so much more use out of it than you thought you would. I think the first look is still my favorite. It compliments the bright blue dress so well. Bright colors suit you so well! You look beautiful in all of these outfits! Love this round up! Such a fun bag! That bag is so fun! Love the pop it gives to all of these outfits! I love that bag. It brings that extra something to an outfit. I had no idea neon could be so versatile! I think I’ll have to go get one for myself now! LOVE that bag!! Its such a fun color! Love how you’ve gotten so much use out of this statement bag. It’s so bright and fun! This bag really is beautiful! Love the bright color, great purse for spring! Such a great replacement find! I love the summary of all the times you’ve worn this bag! So cute! I am such a huge fan of all the neon. Love, Love! Love the neon, so fun! such a great bag for the upcoming warm weather! love these outfits! Aww Rachel we totally understand sweats being the comfiest for you right now. You could even do an outfit post in sweats and I’m sure it would look glamorous :)! I love your Saint Laurent bag and all the many ways you have styled it. Top of my wish list is the Rebecca Minkof version. I love all of the bright colors you wear! Who would have thought a bright yellow bag would be so versatile!? I have a neon crossbody from J.Crew that you’re right- it’s amazing how much use you get out of a neon bag! Such a cute bag… I hadn’t realized how many looks you style it with. For such a bright color, your outfits flow so seamlessly that it’s hardly noticeable that you wear it over and over. Love it! Love the bag! I love how you have styled it. Such a great bag!! I love the color! Can never go wrong with a bright Rebecca Minkoff bag! I cannot believe how versatile you have made that bag, you look gorgeous! Love this bag – such a great statement colour! So cute! 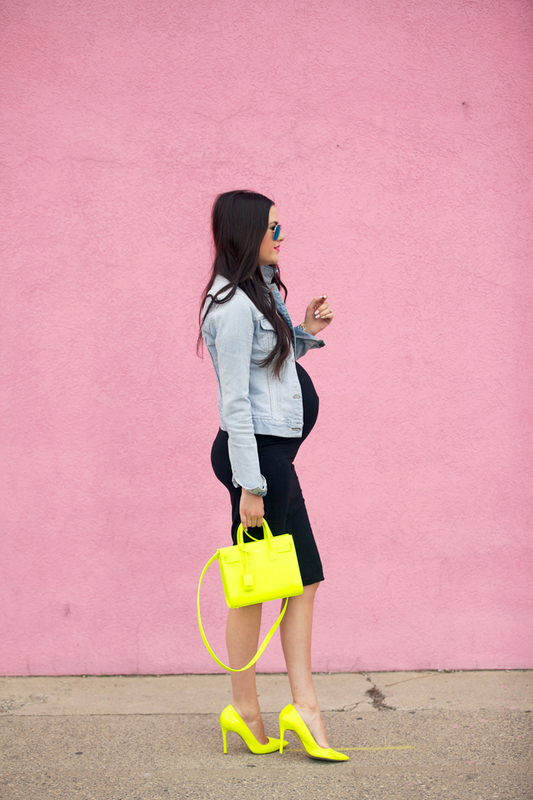 The perfect pop of neon! No worries I don’t mind seeing more shots of this bag. It’s such a bright pop that works so well with every look whether it’s casual or dressy. The bag, and color of the bag are gorgeous. I love that you chose a bright and bold color. Nothing makes an outfit more playful and fun than neon colored accents. Yes! Love those neon pops. Great looks. Such a great color! I picked up a neon yellow blah a few years ago ago and I found that it paired easily with so many outfits! Such a great find! Love the pop of color that bag adds! wow that purse is awesome!!! Adore how fun this neon yellow is! Not to mention I love crossbody options because it leaves your hands free! I love this bag. The perfect pop of yellow for spring. No need to apologize, Rachel! Any woman who has had a baby understands! That last week is miserable-the only thing you are motivated to do is have that baby!! :-) You have done such a great job keeping up on your blog and staying positive throughout the pregnancy. Definitely give yourself a break over the next few weeks (and months)! Such a gorgeous bag, Rach! I love it! I love Saint Laurent and love that bag! I have been eyeing that bag for a while. It literally is the perfect pop of colour! it is an awesome bag! so bright! This color is the perfect summer hue! I love how it goes with literally everything! Awesome bag! I’ve noticed it here before, its so versatile. And Saint Laurent too! I love this bag so much and I love how you’ve styled it so differently. Very cool! Don’t apologize! Obviously there are more important things happening in your life right now. :) Plus, this was adorable! Love that neon yellow!! It’s such a happy color. it’s such a great bag! I love the neon — it’s very wearable! I want these Kate Spade heels!! I love how bright it is! definitely great for making a statement! In love with the color of that bag! The bright pop of neon yellow from the bag is absolutely delightful, it certainly adds a fun vibe to all the outfit looks! Oh yes, this bag is amazing, I’m all for bright colors for bags! It really stands out and is that perfect pop of colour! So fun to see all of the ways that you styled this bag! Love it paired with the all grey look. In love with the color of that bag and those shoes!! Rach, this is one of top favorites out of your handbag collection. I love neon! It really does go with so much. I have a Marc by Marc neon bag that will help me achieve some of these amazing looks that you collected. I think it’s lovely to do a round up of the many ways you can style a particular item. Keep relaxing in those sweatpants/tees!! Your baby girl will be here so soon!